I thought I would keep you up to date on my culinary conquests. When I was still living at home with my parents, Mom did not use some of the things that other people of the day used for cooking in our home town. Then again she used some things that no one else used. For instance Mom served Hominy, a peculiar, flavorless thing that I only now discovered comes from corn. But she never used "Pork and Beans" for anything. I am uncertain if this was upon principal of some kind or she just didn't like them. I was in for an adolescent awakening as a Boy Scout and on a troop camping trip when everyone broke out their cans of "Beenee Weenee". This seemed strange food indeed. Later on a friend who's parents were not home decided to serve me a family delicacy of browned hamburger and Pork & Beans heated in a pan. This too seemed unusual but not terribly bad. In my current non-gluten, no meat environment, I find these past experiences useful. Neither Ramen Noodles, Chicken Pot Pie, nor Chicken Noodle Soup appealed to me today and I decided to unfurl my wings and soar to new culinary heights. 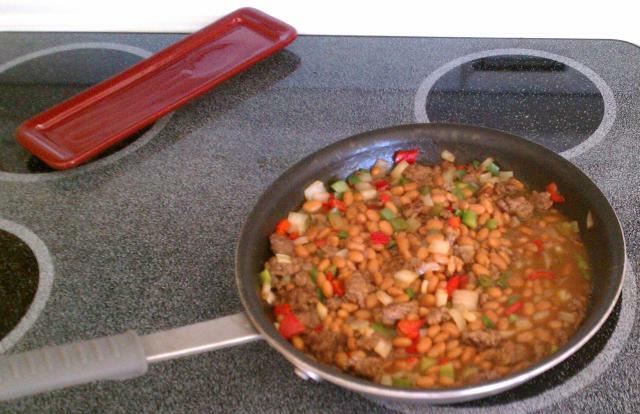 A small amount of hamburger browned, with mounds of chopped onions, big red peppers, big green peppers, small red peppers, small green peppers and Bush's Baked Beans. I can't tell you more about the small peppers other than color because I didn't pay attention to the terminology. I simply grabbed handfuls of whatever from Publix. What does it matter really. They add a festive color and spice things up. All I can tell you is this dish would have been the talk of the plain beans and hamburger neighborhood. 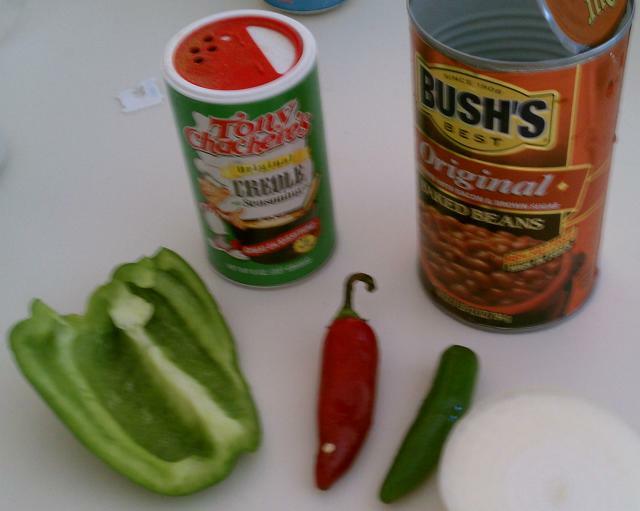 I've named my dish "Montezuma's Beans" in honor of President Jimmy Carter (a little 70's humor there). One caution: Do not rub your eyes after preparing this dish, which I just now did and must say "hasta la vista" because I can no longer see to type.